Friday, March 22 the middle school students were transformed into a wax mueum. Students from the 6th grade were Ancient Greeks. 7th grade were famous people from Medieval History and our 8th grade class were famous people from our American History. They were a sight to see! Cardinal Prefect Angelo and Cardinal Amato from the Congregation of the Cause of Saints anticipates the process of submitting the Cause for Bishops in the fall of 2016. Per Cardinal Amato, "the recognition of a miracle through the intercession of the Servant of God is required for Beatification. I encourage you and all the parishioners of your respective communities to promote awareness of Bishop Gallegos and invoke his intercession. Bishop Alphon se Gallegos, O.A.R. Born in Albuquerque, New Mexico, February 20, 1931, professed religious vows in the Order of Augustinian Recollects in 1951 and was ordained priest on May 24, 1958. 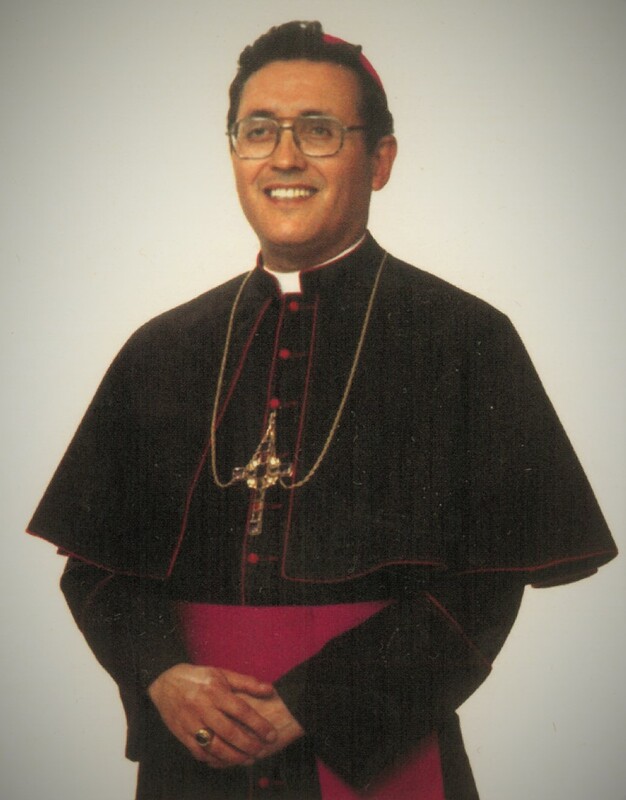 He exercised his priestly ministry in New York, Kansas and in California and was consecrated Auxiliary Bishop of Sacramento on November 4, 1981. He was full of life and always positive in everything he said and did. His deteriorating eyesight was not a hindrance for him to bring light and life to others, because he did not see with the light of eyes but with the greatness of his heart. He championed the cause of the poor and the marginalized, the migrants and the youth. He defended the right of the unborn and tended to the sick and the aged. He was always attentive and loving to all. But above all he was a man of prayer, a loyal son of Our Lady of Guadalupe. A vehicular accident on October 6, 1991 took the life of this gentle man, loving priest and caring bishop. God our Father, in Bishop Aphonse Gallegos, you gave a light to your faithful people. You made him pastor of the Church to feed your sheep with his words and to teach them by his example. We pray that his life of holiness and service to the People of God by acknowledged and that this loyal son of Our Lady of Guadalupe be counted among the saints of your Kingdom. We ask this blessing through Christ our Lord. Amen. We the community of Holy Family Parish (located in Citrus Heights, CA), all members of the Body of Christ, strive to be a voice of truth and clarity in our faith. We worship God and celebrate the gift of Jesus Christ in Word and Sacrament. Unified by the Holy Spirit, we commit to the on-going conversion to Christ in ourselves and in our parish. We are committed to extending Christ`s unconditional love to all, especially the neglected, the oppressed, the aged and the wounded of heart. We welcome all to share in the richness of our Catholic heritage. Nosotros, la comunidad de la Parroquia de la Sagrada Familia, todos miembros del Cuerpo de Cristo, nos esforzamos por ser voceros de la verdad y de la claridad en nuestra fe. Nosotros glorificamos a Dios y celebramos el don de Cristo en Palabra y Sacramento. Unidos por el Espíritu Santo, nos comprometemos a una continua conversión a Cristo en cada uno de nosotros y en nuestra parroquia. Nos comprometemos a compartir con todos, el amor incondicional de Cristo, especialmente a los rechazados, oprimidos, ancianos y los que sufren. Todos son bienvenidos a compartir en las riquezas de nuestra tradición Católica. Please click here for directions to our parish.